Alan Garner: What if Doug's dead? I can't afford to lose somebody close to me again, it hurts too much. I was so upset when my grandpa died. Phil Wenneck: How'd he die? Alan Garner: World War II. Phil Wenneck: Died in battle? 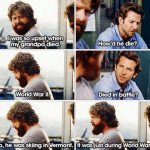 Alan Garner: No, he was skiing in Vermont, it was just during World War II. Oh,you having a bad day? Did you die? ​Got a couple of tips,help you guys stay out of jail. 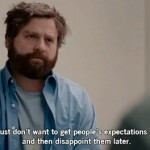 I just don’t want to get people’s expectations up,and then disappoint them later.